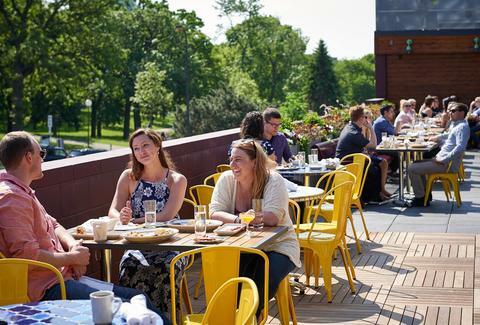 Because the time to enjoy outdoor patios in the Twin Cities tends to come and go all too quickly (thanks, weather), locals try to use them as much as possible when they're around. Therefore, when that snow finally melts and the sun comes out, we can’t imagine anything better than sitting out on a gorgeous outdoor rooftop patio with a delicious cocktail and full city views. Because summer's a-comin', here’s our rundown of places to hit in order to elevate your season to a whole new level. Literally. Union boasts the only year-round, glass-enclosed, heated patio in town. It also offers several great specials, such as the post-8pm Late Night Date Night, a three-course dinner for two that includes a bottle of wine for just $50, and a celebrity-themed Drag Queen Sunday brunch with $15 bottomless mimosas. CRAVE is the parent restaurant of Union, which is less than one block away. The patio gives patrons a bird's-eye view of Downtown’s theater district, and it's also a solid go-to for a beer and a good place to unwind. Whether you’re just getting done with a long day at your desk and need a little liquid relaxation, or are making a trip for a show in the area, it’s definitely worth a visit. If you want a one-stop shop for locally brewed craft beers, look no further. 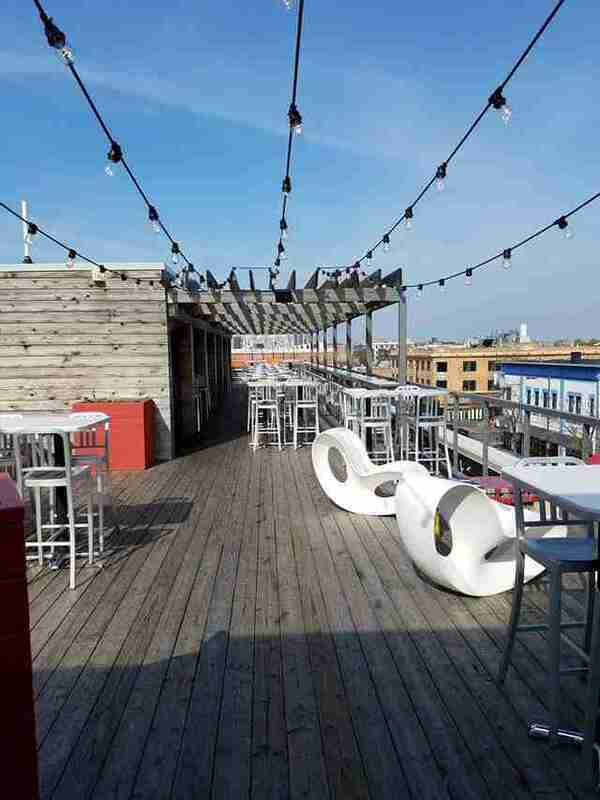 Located near Lake Calhoun, it's a solid post-beach hangout with plenty of sitting and standing room, and a few outdoor heaters so you can enjoy the chillier summer evenings. Not only is the view charming as hell, this outdoor space also has two full bars, a fire pit, couches, and an uber-fancy VIP area with bottle service for all you top-shelf locals out there. Now under new management, the restaurant promises upgraded cuts of steak and more creative takes on sushi, so bring your appetite. 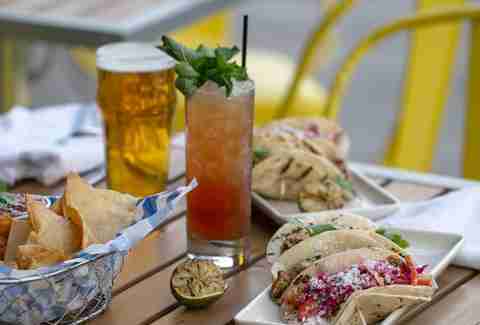 The rooftop at St. Paul’s premier Irish pub offers an excellent view of the city, solid bar snacks (including gluten-free options), and a swath of terrific whiskey options. There are a few TVs at the bar, but weather-permitting, you should be outside. After all, there’s nothing that makes a day in the sun more enjoyable than great scenery and a 2 Gingers cocktail. Right? Right. This Uptown location is a good pick for a relaxing weekend afternoon. There’s a lot of seating up on the patio, with plenty of umbrella cover and a view of Lake Street that runs all the way from Lake Calhoun up to Calhoun Square. Order up some wine, the antipasti, and a pizza, and let the fun begin. 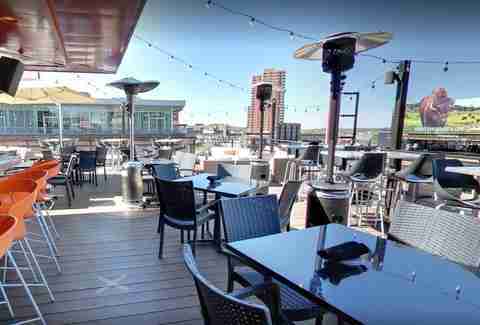 Over on the other side of the river sits the newly remodeled rooftop patio (the largest one in St. Paul) just above Cossetta. The outdoor bar and wooden trellis give it a comfortable, backyard feel, making it an excellent spot for that after-work martini and a few small plates to share with friends or coworkers. moto-i's rooftop bar is beautiful, to say the least. At night, it's dimly lit, mostly with hanging lights, making it feel like you’re at a neighbor's Tiki party, only with more sake. Just a warning: It can get insanely busy, but the experience is totally worth it (think: slurping down a big bowl of ramen and enjoying an ice-cold Sapporo). 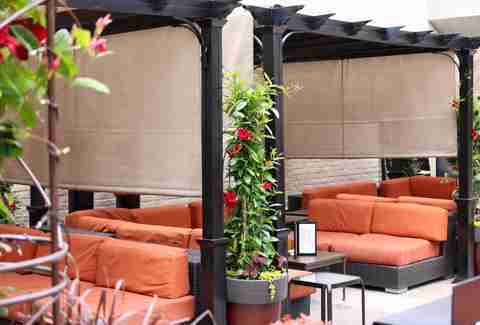 The worst-kept secret in Downtown, Brit’s has a fabulous patio that goes far beyond simple dining. Outdoor second-level bar? Check. Indoor overflow in case of unexpected summer showers? Check. An all-grass, barefoot bocce ball court and outdoor movies? Check and check! Beyond that, Brit's has a wonderful selection of beer and whiskey, both of which go particularly well with an order of the Scotch eggs. Reviving the sagging Loring Park dining scene is this Southern low-country restaurant. Head here for gorgeous views of the Basilica and Loring Park, unbelievable fried chicken and biscuits, and expertly mixed cocktails (give the beet juice Negroni a shot). If you can’t get enough of the cuisine, there’s a takeout counter set beside a fabulous giant squid mural near the back door. So, they’re not standalone rooftop bars, but these stadiums’ upper-deck dining and drink options are totally worth the price of admission. Target Field has consistently knocked it out of the park with their al fresco menu items, including goat meat burgers, wild rice soups, vegan Sriracha brats, and Kramarczuk’s sausages. CHS Field isn’t far behind, with an impressive beer garden featuring 30-plus taps, handmade sausages, and fresh cupcakes. This place is good for more than just a big hunk of meat (although the idea of gnawing away at a massive bacon chop while taking in the view isn’t entirely unappealing). It also has a laundry list of delicious cocktails to choose from, making it a great place to sit and hang when the weather gets nice. 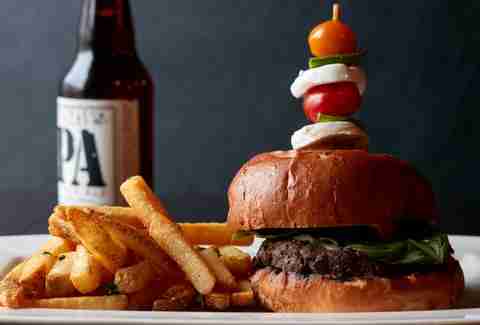 In fact, it’s an admirable alternative to Stella’s, which happens to be the only thing obstructing your view of Downtown’s beautiful skyline from the rooftop. A recent addition to Lowertown, Ox Cart is a cozy New American-style restaurant featuring dishes like duck popcorn, chicken liver mousse, short-rib sliders, and blackened catfish. 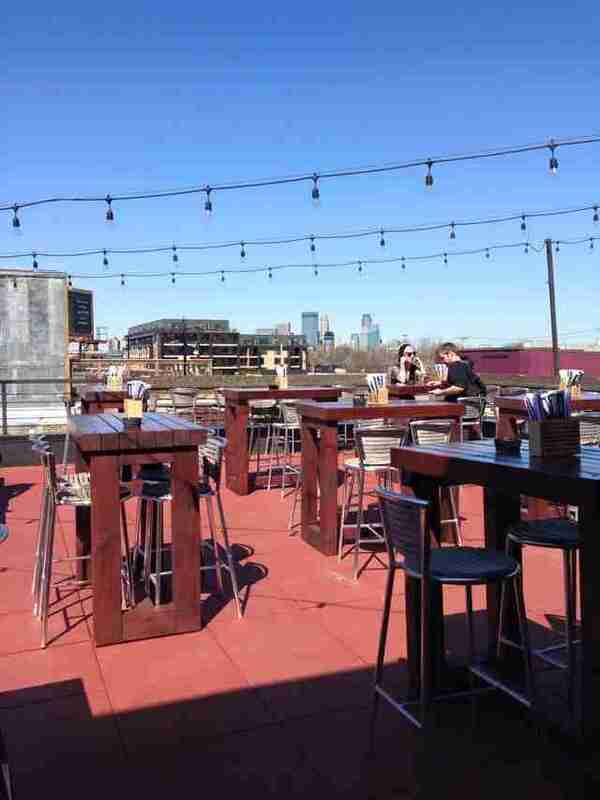 Located right off of Interstate 94 and Highway 52, it boasts a great, affordable beer list and a huge roof deck where you can hear all the cheers from nearby CHS Field. 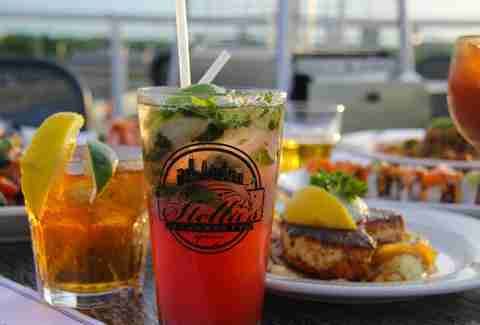 Speaking of Stella's, this place has a tendency to get downright crazy, but with good reason: the drinks are strong and the view is spectacular. Not only can you see most of Uptown, you also get a clear shot of the Downtown skyline, which is truly beautiful. It's the kind of place where you’ll feel compelled to order a giant fruity drink (with a tiny umbrella -- and there's nothing wrong with that). So just let the summer breeze blow across your face as you watch the sun set across Uptown. Becki Iverson is an overstimulated millennial with multifarious passions she somehow finds time to catalog in her blog, Compendium. Follow her on Instagram for snapshots of how her brain operates. Keane Amdahl is a veteran Twin Cities food writer who often likes to drink as close to the stars as he possibly can. Follow him on Twitter @FoodStoned to see if he ever makes it there.